With SEC Media Days now complete here are three things that I want to rant about. 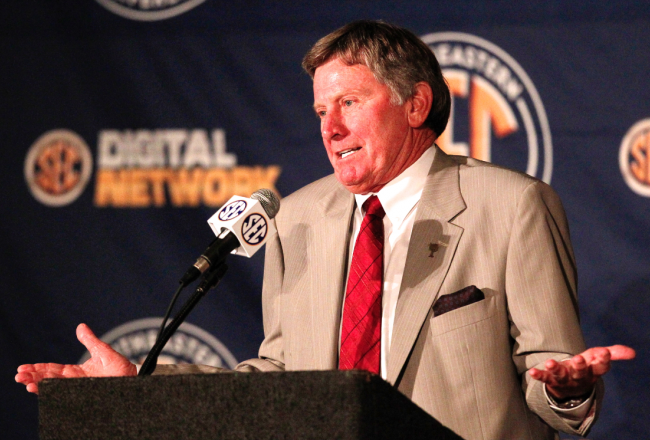 Steve Spurrier opened SEC Media Days by wearing a face that matched his own tie. Via. Johnny Manziel and the dichotomy of being a 20-year-old celebrity. There was no neutral ground for Johnny Manziel at SEC Media Days. You loved him or you hated him. He was praised for displaying the same confidence and composure that that won him the Heisman Trophy while being peppered with questions under the spotlight. He was critiqued for showing too much arrogance. There was no middle ground. As much as I hate making the comparison, he matched Tim Tebow’s ability to polarize a room – and more universally, the internet. At the very crux of all the Manziel chatter is the predicament that he finds himself in. The issue is not the Manning Passing Academy. The issue is not underaged drinking (alleged). The issue is not what his family can and cannot afford. The issue is this: Johnny Manziel is twenty years old and he is famous. Really, really, famous. Really, really twenty years old. He’s the most popular college football player on the planet and one of the most famous figures in his sport’s history. But he’s twenty years old. He was the youngest player ever to win one of the most prestigious awards in all of sports, but he’s still young. His fame and his age are not two mutually exclusive characteristics. They are very much coinciding. People struggle to comprehend how Johnny Football can claim to be a “normal” twenty year-old college kid while describing the highlights of his offseason as, “Meeting Drake backstage at his concert in Toronto before flying to Cabo for Spring Break and later getting to chill with LeBron James.” At first glance, maybe those two concepts – the “normal young kid” notion and the “rock star” persona – disagree with each other. But maybe, just maybe, slightly deeper thinking can explain the paradox. We live in a controversy-driven culture. The internet had exacerbated that problem. But if you can’t see that Johnny Manziel is equal parts normal kid and celebrity, then you have less common sense than society seems to think he has. All of that is true. A.J. McCarron, however, does not have a Heisman Trophy. A.J. McCarron is not bankrolled by a wealthy family. This is not intended as an insult, but A.J. McCarron doesn’t have Johnny Manziel’s charisma or personality either. McCarron is humble and polite. Manziel dominates a room. These are two different quarterbacks from two different backgrounds who behave in two different ways. I’m not going to condemn one for being wrong and award one for being right. Manziel’s social life is capitalizing on his opportunities. For McCarron he capitalizes with National Championships. Each is true to himself. You could make a darn compelling case that each is living the better life. Is anybody else over Jadeveon Clowney? I stand by everything that I have ever said about Jadeveon Clowney. He’s a beast. He plays his position better than any player in the country plays theirs. He’s scary. He’s not human. But good gracious his legend is growing awfully out of control. I wrote a few weeks ago that I didn’t think Clowney would live up to the offseason hype. My reasoning: the hype is darn-near unparalleled to begin with for a defensive player, his defense lost a lot of talent and teams may be able to scheme better for him and he doesn’t put up statistically monstrous games on a consistent level. Those are admittedly nit-picky criticisms but when we’re dealing with hoopla that is unprecedented (and I think we are for a defensive player), sometimes it takes some controversial disputing over minuscule points to disqualify someone. I learned one thing when I wrote that article: NOBODY TALKS BAD ABOUT SOUTH CAROLINA’S BELOVED BABY JADEVEON!!!. NOT NOBODY, NOT NO HOW!!!! He has a tendency to take plays off. He struggles at times in run defense. He is not the most attractive fellow in the world. All-SEC teams were voted on during Media Days. Twenty people did not vote for Clowney on the First Team. Outrage ensued. Do I think Clowney is First Team material? Absolutely. Was I surprised that he wasn’t a unanimous choice? Somewhat, but things are rarely unanimous these days (remember, we love controversy). Maybe somebody saw a rising star at the DE position while covering the beat trail for his/her college team this Spring. Maybe somebody is saying, “That kid can be better than Jadeveon Clowney.” I bet the folks at Ole Miss are hoping Robtert Nkedkdmfdmdsfeche (spelling?) can be. Maybe a voter has heard something about Jadeveon’s offseason workouts. Yes he’s reportedly run incredible 40 times and benchpressed entire planets, but maybe he’s been letting off the gas a bit. I’m not saying that I agree with any of the things I listed above or that I’ve heard any such inklings, but I haven’t seen what every voting Media member has seen either. Jadeveon Clowney is great. But South Carolina fans – and now fans in general – are putting a hell of a lot of pressure on him. Les Miles is an absolute treasure to college football. He dropped knowledge on the unevenness of SEC scheduling in a very non-Spurrier way (meaning he had facts that weren’t simply demonstrative of his team’s fortune or misfortune). He spoke eloquently about his coaching staff, players and other personnel. He spoke with an Australian accent for a spell (seriously). He talked about Twitter, the United State of America and the Harlem Shake. Posted on July 19, 2013, in Blog, Georgia Bulldogs, LSU, SEC, South Carolina Gamecocks and tagged Georgia, LSU, SEC, South Carolina, Texas A&M. Bookmark the permalink. 2 Comments. Johnny F is going to live his life to the fullest right? I’m sure the NFL would sign him right up to a multimillion dollar deal. Because that’s what they want is athletes that act their age every chance they get. Methinks he changes his tune. Right on sir. I was convinced he was not all THAT, until yesterday. Now don’t get me wrong, I can’t wait untell the SEC starts game PLANNING for HIM. I think he snuck in under the radar last year and ROCKED it. If he does it this year he may be the GPOOE.